Archangel Jophiel mission is to bring beauty to all aspects of life, including: Thoughts, Feelings, Home and Office, Personal Self. 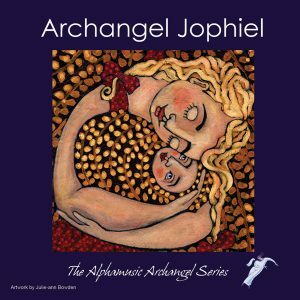 Archangel Jophiel can help you quickly shift from a negative to a positive mindset. Archangel Jophiel helps in absorbing information, it’s good to have it in a background when you’re studying or want to pass tests. Note: Therapist Versions are specially mixed to offer 60 minutes of uninterrupted play. Archangel Jophiel urges you to pay attention to any new thoughts and ideas that come into your mind in the near future. You may be uncertain about a situation or a person in your life. Archangel Jophiel is indicating to you that you will be experiencing flashes of inspiration and creativity. Perhaps you will get an idea for a book or a desire paint, or create something new. There are new projects in the wind. All will be revealed to you when the time is right. Archangel Jophiel brings great joy; he wants to have fun and laughter in your life. Whenever you feel down and fed up, Archangel Jophiel reminds you that he is here to light up your life. Call Archangel Jophiel to experience flashes of insight, clarity, creativity and joy. Archangel Jophiel will help connect you to your inner light. You need joy and play in your life as it revitalises and energises you and feeds your soul. The creative power of God and the Universe is what we use to create our own lives. Energy follows thought, so think and focus your energy on what you want from life and ask Archangel Jophiel to assist you. Archangel Jophiel can then use the universal energy to create whatever you have asked for. When I listen to Alphamusic I feel tranquil, almost floating into different state of mind. I am different physically and mentally. I am totally relaxed.